We played Kilrossanty in the Phelan Cup on Sunday afternoon last in Abbeyside, where unfortunately we were defeated on a score of 1:13 to 0:14. This Sunday we play Geraldines in Fraher Field at 1pm in the third round of the Western Championship. Last weekend saw both of our Junior Hurling teams will be in Championship action. First up on Friday night our Junior B team continued their winning run in the Championship thanks to a good win over a strong Fourmilewater side in Colligan on a score of 1:19 to 0:10. TEAM: S. RYAN, S. O’CONNOR, D. HENLEY, E. BRACKETT, J. HURNEY, P. LYNCH, M. TWOMEY, M. MAHER, D. SWEENEY, E. ENRIGHT, C. KINDREGAN, R. RYAN, J. O’BRIEN, L. HURNEY, M. GORMAN. 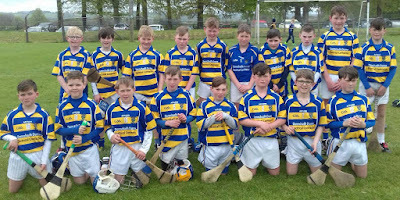 On Sunday evening our Junior C team finished off the weekend with an excellent win over Mellary in a fiercely competitive game again in Colligan, emerging as winners by a single point, 3:08 to 1:13. TEAM: P. BREEN, S. O’GORMAN, D. BYRNE, A. O’RAGHNAIGH, P. COLLINS, D. MORRISSEY, C. DWYER, B. HENLEY, N. DEE, K. DWANE, D. HICKEY, O. YOUNG, D. SMITH, J. O’RIORDAN, J. ORGAN. SUBS: R. SHEEHAN, R. CONWAY, J. MULLEN. On Saturday last a number of our club players were involved with the Waterford Junior and Senior Football teams who took on Cork in Fraher Field. Firstly Gary Hurney was a selector on the Junior Football team where James O’Mahony and Conor McCarthy were on the team. Laurance Hurney was a selector on the Senior team where Stephen Enright, Brian Looby and Michael O’Halloran were on the team that gave a wonderful performance, but unfortunately just came up short of recording a historic victory. On behalf of all in the club we would like to send our sympathies to the family and friends of the late Margaret (Peggy) Burns, Tramore who passed away recently. Peggy’s son Johnny was a key member of our successful Senior Football teams in the 1970’s and 80’s, after which he gave many years coaching numerous underage teams to County Titles. Peggy’s grandsons featured on some of those teams and her great grandchildren continue to wear the club jersey today. Once again we send our sympathy to Johnny and all the Burns family on the death of Peggy. Our ever popular Jack the Joker fundraiser continues this Sunday night in Minnies Bar where the jackpot is €2,400 as on Sunday night Benny Flynn was drawn out of the drum and chose card number 22 which when turned wasn’t the Joker but he did win €50. Jimmo Meehan and Brian Lonergan won €25 each. As well as our group of ticket sellers tickets can be purchased from Village Flowers, Spar, Mousies Takeaway, Minnies Bar, Abbeyside Post Office and Crotty’s Corrner Bar. We play Kilrossanty in the Phelan Cup on Sunday afternoon at 3pm in Abbeyside. Last weekend saw both of our Junior Hurling teams will be in Championship action. First up on Friday night our Junior C team got their Championship campaign off to a good start with a victory over An Rinn in Dungarvan Club Grounds whilst on Sunday our Junior B team kept up their winning ways with victory over Ballyduff Upper in Cappoquin. This weekend our Junior B team take on Fourmilewater in Colligan on Friday night at 7:30 and on Sunday our Junior C team play Melleray in Cappoquin at 12 noon. On behalf of all in the club we would like to send our sympathies to the family and friends of the late Bridie Beresford who passed away recently. Bridies grandsons are valued players in the club and have helped us win many county titles in recent years. A couple of games played in the last week with St Mary’s of Clonmel coming to the Burgery on a lovely Tuesday evening for a hurling challenge. The boys didn't play anywhere near their potential and lost out by 4 pts in the end to a strong outfit from south Tipp. Thanks to St. Mary's for travelling. Then Friday evening we headed to the Mill Field in the Nire to take on Fourmilewater in Round 3 of the Town & Country Hurling League. Our first attack saw us score a goal but FMW fought back to take the lead with 4 pts of their own. With half time approaching the heavens opened and we gained the advantage again to lead by 2 pts. 2nd half and an early goal for us, but credit to FMW, who came back at us again, but we held out thanks to a couple of scores as the game was nearing the end. Panel for both nights: S Walsh, A Barrett, B O'Connell, F Murchu, J Fitzgerald Drummey, K Cosgrave, S Queally, D Morrissey, D Walsh, J O'Donnell, C Sweeney, J O'Donovan, E Keohan, B Callaghan, J Mulcahy, C Dunne Fitzgerald, D Cosgrave, B Crotty. Training continues Friday evenings 6 till 7. Next round of T&C is against Ballyduff Upper, June 2nd in Abbeyside. Jack The Joker - Jackpot Won!! Our ever popular Jack the Joker fundraiser continues this Sunday night in Minnies Bar where the jackpot is €2,000 as on Sunday night Ciara Hallahan was drawn out of the drum and chose card number 24 which when turned was the Joker meaning she won the jackpot of €8,200. Richie Ryan and Sonya and Niamh, Marion and Anthony won €25 each. As well as our group of ticket sellers tickets can be purchased from Village Flowers, Spar, Mousies Takeaway, Minnies Bar, Abbeyside Post Office and Crottys Corrner Bar. On Sunday last our Senior Footballers got their Championship Campaign off to a winning start thanks to a win over Rathgormack in Leamybrien. We have been drawn to play An Rinn in the next round of the Championship. TEAM: S. ENRIGHT, C. McCARTHY, B. LOOBY, D. COLLINS, J. ELSTED, S. O’HARE, R. FOLEY, J. O’MAHONY, J. BERESFORD, D. LOOBY, P. HURNEY, S. BRIGGS, M. O’HALLORAN, M. MAHER, M. FERNCOMBE. This weekend we are scheduled to play Kilrossanty in the Phelan Cup, keep an eye on Facebook and Twitter for day and time for this match. Our Intermediate Footballers travelled to Collligan on Sunday night last to begin their Western Championship campaign, where they recorded a very good win over Ballyduff Upper. Whilst the main talking point from the game was the 4 goals scored by Jason O’Brien, it was great to see Peter Phelan back playing with the club after a number of years playing in London and Conor Moloney also made a welcome return to the club colours. TEAM: K. DWANE, C. DWYER, D. HENLEY, G. BREEN, J. RYAN, P. LYNCH, M. POWER, C. MOLONEY, J. HURNEY, C. McCARTHY, N. DEE, R. RYAN, E. BRACKETT, J. O’BRIEN, K. DEE. SUBS: M. GORMAN, G. HURNEY, E. KIELY. This Saturday night we play Modeligo in Fraher Field at 8pm. This weekend our Junior Footballers are due to play their first game of the Western Championship, but at the time of writing these notes the game has not been confirmed due to the Minor Championship. Please keep an eye on Twitter and Facebook for confirmation of the game. The Déise Draw has been changed for 2017 and it now consists of 6 draws costing €15 a month or €90 in total. The Déise Draw has been our main fundraiser for many years and the funds raised from the draw help us meet the ever rising costs associated with running our club. If you would like to join the draw please contact any Committee Member. Our ever popular Jack the Joker fundraiser continues this Sunday night in Crotty’s Bar where the jackpot is €8,200 as on Sunday night Fred Forsey was drawn out of the drum and chose card number 6 which wasn’t the Joker but he did win €50. Richie and Sonya and Emma Toal won €25 each. As well as our group of ticket sellers tickets can be purchased from Village Flowers, Spar, Mousies Takeaway, Minnies Bar, Abbeyside Post Office and Crotty’s Corrner Bar. On Saturday last our Senior Footballers recorded a comprehensive win over Gaultier in the Phelan Cup. This Sunday we play Rathgormack in the first round of the County Championship in Leamybrien at 3:15 pm. This Sunday night we play Balyduff Upper in the first round of the Western Championship at 7pm in Colligan. Our new range of Club Leisure wear has arrived and is proving extremely popular with young and old alike. If you missed out on the gear this time then there’s no need to panic as we will be taking orders for the next two weekends. We ask that all team managers book their times for training / matches with Michael O'Donovan in advance of returning to training. Managers must notify Michael in advance if they wish to change from their allocated time. On behalf of all in the club we would like to send our sympathies to the family and friends of the late Mrs. Kathleen Collins who passed away last week. Mrs. Collins’ sons, Mick, Ger and Jim all played with the club for many years and her daughter Marita has been a great help to the club through her work in the Dungarvan Observer office. Mrs. Collins’ grandsons continue the great family tradition by playing for the club today and once again we send our sympathies to her family especially to Marita, Mary, Jim and Ger.